The MBTians’ involvement in the relief work for the flood affected people revealed their role as responsible citizens compassionate to those in distress and suffering. More than 600 students and faculty members worked as volunteers at the various collection points at B-Hub in the Mar Ivanios Vidyanagar, Women’s College, Trivandrum Airport, Nishagandhi Auditorium, SMV School, Cotton Hill School, , Corporation Office, Barton Hill Engineering College, and the R.P. Mall Kollam. They helped in sorting, packing, unloading the aircrafts, packing of materials, distribution and packing of Medicine and so on. MBT’ians also assisted the relief work at the Relief camps at Chenganassery, Kuttanad, Pathanamthitta, Aranmula, Chengannur and Aluva Besides, Our students assisted the survey work in the flood – affected areas at Aluva. Students contributed generously to the relief works, which amounts to Rs. 1, 28,000/-. The faculty and staff donated around 14.41 lakhs towards the rehabilitation activities. 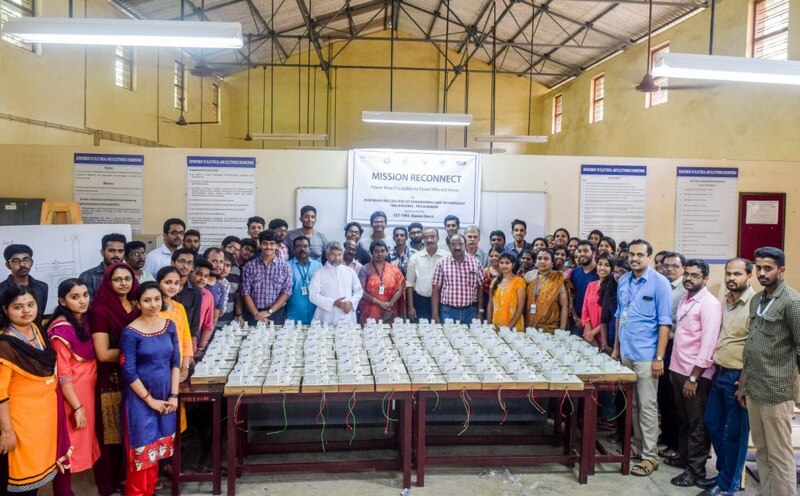 The IEEE students and staff supported the KSEB by making 120 single supply panel boards to restore electricity connections as part of their Mission Reconnect Programme. They designed and fabricated the panels at the electrical workshop at the College and handed over the same to the KSEB Authorities. The letter of appreciation from the KSEB is cited below.